Your base should be something that is smooth, has body, and burns well. There are a few different bases I would suggest, depending on your desired flavor and effect. ~Damiana: Nice herbacious unique flavor, and stronger relaxing effect. If you are looking to make a smoke blend to give this calming, creative, uplifting effect, I would suggest Damiana as your base. It burns very well, tastes great, and is easy to roll. ~Raspberry Leaf: Another nice, fluffy base for every day smoking blends. I suggest blending Raspberry and Mullein together for a nice base. You could even do one third of Damiana for a little more of a relaxing effect. You can play with the ratios and find your favorite! Re-mist lightly with water to freshen up the leaves and make a nicer, smoother smoke. Your modifiers will be the second largest quantity in your mix after the base. They will augment and enhance the effect of your base. So, depending on your desired effect, choose 2-4 modifiers to add to your base. Be creative! 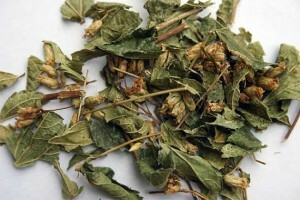 To learn about the effects of different smokeable herbs visit our blog HERE. 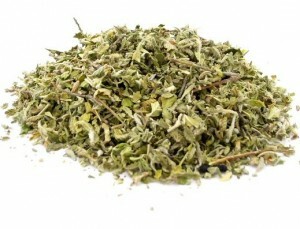 Damiana blends well with other relaxing, psychotropic herbs like Blue Lotus, Passionflower, Wild Dagga, Uva Ursi, Mugwort, Skullcap, Wild Lettuce, Hops, California Poppy, Calea and Catnip. 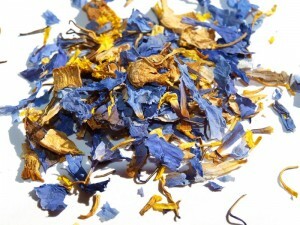 Mullein and Raspberry Leaf blend well with herbs like Chamomile, Uva Ursi, Mugwort, Lobelia, Marigold, Coltsfoot, Marshmallow, Marjoram, Rose Petals, and Sage. This herb will be in a smaller amount as they have a stronger taste, and they will finish off your blend with a unique flavor! Be careful with herbs like Clove which have a strong taste and medicinal effect. ~Peppermint, Spearmint, Lavender, Sage, Thyme, Clove (crushed or ground), Licorice Root (crushed or ground) and Stevia. For example, you’ve decided to make a relaxing smoke mix. Your base is Damiana. Place 3 handfuls of Damiana in a bowl. Your modifiers are Blue Lotus, Mugwort and Wild Dagga. Mix these together first in equal parts, then place 2 handfuls of your modifiers in the bowl. Your flavor twist is Lavender. You just want a subtle flavor Take a 1 very small handful of Lavender and place it in the bowl. Mix it all together, and you’re done! Use a nice pinch your natural herbal smoking mix in a rolling paper, pipe, or vaporizer. Buy Harmony Herbals Own Perfected Herbal Smoke and Vaporizer Blends Here!